Injured Mansfield Town keeper Jake Kean could be fit again for the trip to Morecambe on Saturday, 25th March. But he could then face a real battle to win back his shirt. The loanee Sheffield Wednesday stopper suffered bone bruising in a challenge during the home win over Newport County last month. 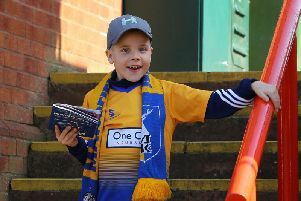 “I spoke to Jake this morning and he’s hoping to be back in training at the back end of this week,” said manager Steve Evans. “So we’d probably say a realistic objective is Saturday week to be on the pitch. Evans also has two centre halves champing at the bit after injury in Kyle Howkins and George Taft. “Kyle is fit,” he said. “We just decided we wanted a more attacking bench. He has been fortunate as he’s been able to have a couple of games at West Brom and a couple of closed doors games with ourselves too. “George is fit in terms of being injury-free, but is he ready for competitive games and the heat of battle? That remains a question.